The frequent flooding of Kampung Baru, and the hardship it brings to residents of the heritage village in the heart of Kuala Lumpur, may soon be things of the past thanks to the creativity and innovativeness of students. 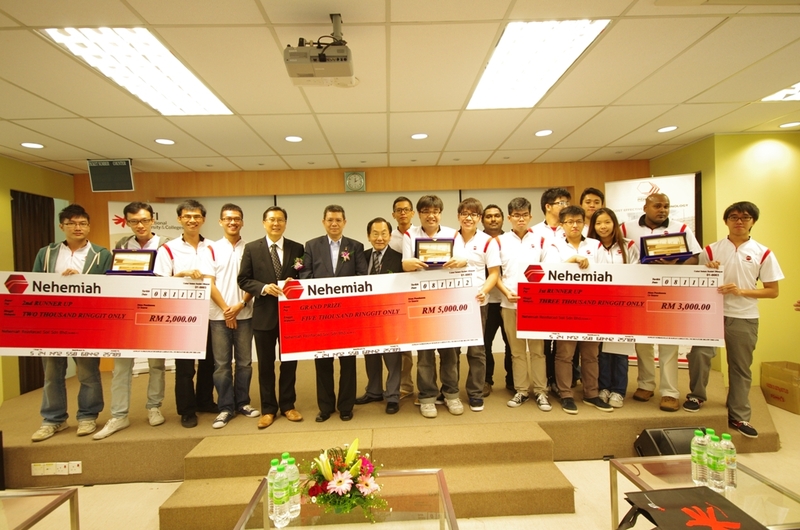 The search for a permanent solution to Kampung Baru’s flood woes brought together engineering, construction management and architectural design students for the finals of the Nehemiah Design Competition 2012. Jointly organized by Nehemiah Reinforced Soil Sdn Bhd and INTI International College Subang (IICS), the event involved 15 teams of students from higher education institutions across Malaysia presenting holistic solutions that are both structurally sound and aesthetically pleasing by incorporating ‘green technology’ features. These were in the form of scale models complete with technical specifications. INTI was represented by two teams: IICS’s INTIgenieur Generation and INTI International University’s Sentinel. Their models as well as others had to comply with the rule that each should measure not more than 1m in length, 0.5m in width and 0.5m in height. The cost of construction was also limited to RM200. Each team was also required to present its technical posters and/or multimedia presentation at an exhibition booth. Y.B. Dato’ Saifuddin Abdullah, Deputy Minister of Higher Education Malaysia, was Guest of Honour at the event which saw Universiti Teknology Malaysia winning the first prize of RM5,000. INTI International University and UTAR won RM3,000 and RM2,000 respectively as second and third placed winners. “The competition is in line with INTI’s project-based learning (PBL) approach to education which seeks to develop students’ global employability skills. INTI’s students have undertaken 50 PBL projects in the past year in collaboration with industry partners. The figure has increased to 55 projects in the first half of 2012 alone. Real employer projects are introduced in the classroom to help students develop problem solving, collaboration and communication skills. PBL is becoming a key strength for students’ learning experience across INTI’s campuses, and will serve as an increasingly important component of education for years to come,” said Dr Philip Tan, Associate Vice President, Academic Affairs, IICS. Students of INTI benefit not only from its over 25 years of experience and strong track-record, but also gain from the global synergy and resources that Laureate International Universities provides. INTI is part of Laureate, the world’s largest private education network with a presence in 29 countries, with more than 60 accredited universities and 130 campuses, serving more than 740,000 students globally. For more information on INTI’s programmes, call 03-56232800 / 06-7982000.